I'm proud to share that I am featured on Deepak Chopra's new album & book, Home: Where Everyone Is Welcome. I perform on a track titled "Survivor" that is inspired by William Jimeno, a Colombian American who was a first responder to the 9/11 attacks in NYC. September 11 impacted me because of my experience a few days prior. My Mother and I had planned a trip to NY. I changed my mind because I had a horrific dream that I was crossing over on to a bridge and saw massive explosions. When I woke up, I tried to work out what it meant. I cancelled the trip and told my Mother. She thought I was crazy. I wrote a poem at the time, “Actions Unheard,” and placed it in my collection of poetry. I titled it “Actions Unheard” because it hadn’t happened at that time, but left such an experience in my heart that I couldn’t shake. Years later, I performed on this track song “Survivor.” I interpreted the music as being in the mist of everything that encompasses that word. As I learned more about Mr. Jimeno, I realized that in performing this song, I was perhaps coming full circle, as 9/11 was integral to my life. This project is personal. I am a 6th Grade Dual Language teacher, and I teach a class of 32 Mexican students. My students have hard-working parents with their own immigration stories. On February 16, 2017, the day of the “Day Without Immigrants” events (which included boycotts to show how immigrants are vital to our country), only twelve students were in attendance. On that day, I gained a deeper understanding of respect for my immigrant brothers and sisters. I am a first-generation American. I never looked at it that way before. I always stated, “I am Puerto Rican,” because my Parents were Puerto Rican. When my Father, Susano Santiago “emigrated” to the United States, he was traveling to an unknown place. I use the word, “emigrated,” because on March 2, 1917 Puerto Ricans were granted US citizenship when President Wilson signed the Jones-Shafroth Act. My Father had a second-grade education when he came to the US and worked hard to bring my Mother. My mother arrived in the US with a 6th grade education and my older Brother, Luis Santiago. She learned to speak English by watching “Sesame Street.” Both of my parents worked in the chicken plant and later my Mother worked in a sewing factory at $1.75 to support our family. I learned from an early age that I had to work hard, be respectful, and never take anything for granted. Although my parents did not understand my dream of higher education or music, they understood that I wanted to explore. My parents told me that our family had a lot of land in Puerto Rico with acres of fruits, vegetables, etc. in the mountains of Utuado. As the land was sold for pennies to a dollar, the newer generations turned to professions of education, counseling, healthcare, and music. Their favorite pastime was singing folklore music. 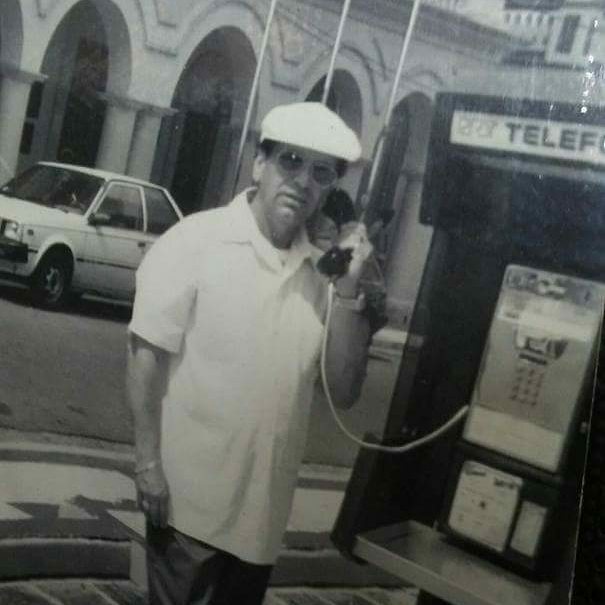 My real Paternal Grandfather on my Mother’s side, played the “Cuatro” and sang around the island when he wasn’t making furniture. On my Father’s side, there was also a lot of music after working in the sugar cane and farming fields. I didn’t learn to play the “Cuatro,” but music found me. I learned that through music, I could write about my life, family, and different things that impacted my journey. Every immigrant is a “Survivor.” In this family photo, there is a picture of me when I was younger. I remember how hard my father worked to get the money for my Mother to buy the fabric to make my yellow dress with the white brick-a-brack. I remember seeing my Mother making that dress and many of my other dresses as well. I wore that dress proudly on picture day and felt special. The other picture is of my Dad on the phone. I can only assume that he was calling our family in Puerto Rico and asking how they were doing. The other picture is of my two Brothers, my Mother, and me. (Luis Santiago, Edilia Santiago, me, and Ivan Santiago) The later picture is of my Father Susano Santiago and me walking in the mountains of Utuado, Puerto Rico as he talked about his life.